Payroll Manager stores the payroll information for each tax year in a separate data file on your computer. For example, if your company is called ‘ABC Ltd’, then your payroll information for the period April 2017 to March 2018 would be contained in a file called ‘ABC Ltd 2017-18.pay’. In order to continue processing payroll for a new tax year (i.e. from April 2018 onwards) you need to create a new data file (which will be called ‘ABC Ltd 2018-19.pay). Payroll Manager does this for you and carries forward all of the relevant payroll information from one tax year to the next. This guide takes you through the process of creating your data file for 2018-19. Important: The legal minimum contribution percentages for Auto-enrolment pension schemes are increasing from 6 April 2018. At the end of the ‘Creating a data file for 2018-19’ procedure, a box will appear asking if you wish to update these minimum contributions accordingly. 1) – Before creating the new file, it is important to ensure that the last pay period in the 2017-18 file is complete to ensure that the correct figures are carried across to the following year for all employees (you don’t need to have filed your final RTI submission at this point, but you do need to make sure that you have finished entering all of the employee pay details). 2) – From the beginning of April 2018, a red message will appear just above the ‘Pay Details’ screen prompting you to ‘Click here to create a file for next year’. Click on this message when you are ready to create the file for 2018-19 (if you don’t see this red message you can instead click ‘File – New – Create a file for next year’). 3) – When creating the new file for 2018-19, Payroll Manager will automatically carry forward the details of all employees (except those that have been marked as leavers in 2017-18), and will also ‘uplift’ the Tax Code for each employee according to HMRC rules as appropriate (e.g. employees on tax code 1150L in 2017-18 will automatically be set to 1185L in 2018-19). Calendar items such as Sick, Maternity and Paternity Pay along with holiday details are also carried forward to the new year. Details of Student Loan deductions, Attachments of Earnings Orders and Holiday Fund balances will also be carried forward to the new year, as will the ’employment allowance’ status of the employer. By default, Payroll Manager will also ‘copy-over’ the pay from the final pay period of last year into the first pay period of the next year. If, for example, an employee has a Basic Pay of £2000 in Month 12 of 2017-18, then Payroll Manager will automatically populate the Basic Pay column in Month 1 of 2018-19 with £2000 (the same rule is applied to weekly, 2-weekly and 4-weekly paid employees). If you wish to proceed on this basis then click ‘OK’, and go straight to Step 5 of this guide. ‘No Copy’ – Does NOT copy the data item from the previous years file. ‘Last to first’ – Copies the data item from the last pay period of 2017-18 into the first pay period of 2018-19. ‘Last to all’ – Copies the data item from the last pay period of 2017-18 into ALL pay periods in 2018-19. ‘Copy all’ – Copies data items from each pay period of 2017-18 into the corresponding pay period of 2018-19. When you have selected how you wish the data to be copied over, click ‘OK’ to proceed. 5) – Payroll Manager will show the name of the new file (e.g. ABC Ltd 2018-19) and the location in which it will be stored. Click ‘OK’ to save the new file. 6) – And that’s it! The new data file for 2018-19 is now open and ready to use. 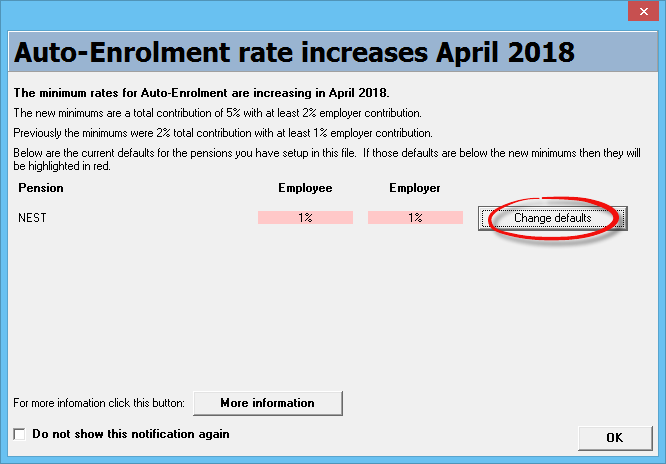 If you have an Auto-enrolment pension scheme, Payroll Manager will display a box (below) prompting you to change the minimum contribution defaults for that scheme. For more information please refer to our Workplace Pension Contribution Increases guide. Q. I need to change my pay dates – how do I do this? A. If for some reason you know that you have the wrong pay dates set in the software then this is the time to change them in the new year file. Click ‘Tools – Pay Dates‘ should you need to do so. Q. I have a credit with HMRC that I wish to claim in the new year – how do I do this? A. 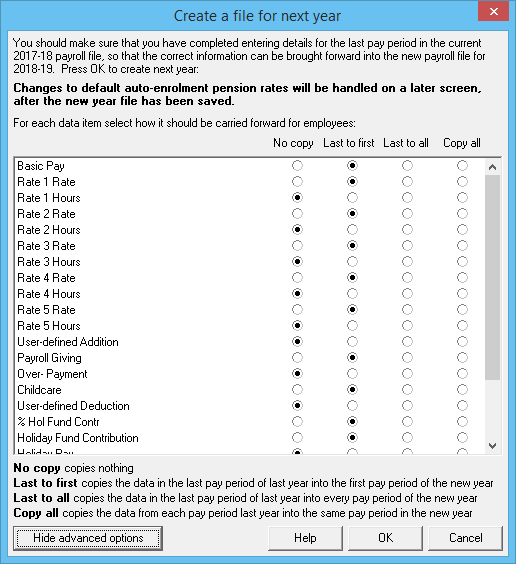 If you have a credit with HMRC from the previous tax year that you wish to set off against PAYE liabilities in the new year then click ‘Employer‘ then ‘Previous Year Overpayment to HMRC‘ from the main menu in Payroll Manager and enter the credit amount in the first tax month of the new year. Q. How do I go back to last years file to print a P60 to give to my employees? A. Should you need to access the previous year file (e.g. to file your final RTI submission or to print P60 forms) you can do so by clicking ‘File – Open’ from the main menu.